Sun, 4.26.2015. Spring is officially here but it's nowhere near warm enough to start our backporch dyeing projects. So... I set out to use some leftover red cabbage for a little kitchen-based color. I used the recipes in Sasha Duerr's Handbook of Natural Plant Dyes. As happens with these things, it became a multi-day project. But my innovation (since we weren't using toxic chemicals) was to employ our slow-cooker. Step 2. Tannin is a mordant that helps bind the dye to the fabric. I had no powdered oak galls at my disposal, so I used my stash of frozen pomegranate peel to make a broth. I simmered my 8 oz. in the broth for about an hour, then let it steep overnight. Step 3. Alum is also a mordant, which brightens the color results. So, I made the recommended potion of alum + washing soda. In went the cloth for about 4 hrs. of simmering in the slow-cooker. 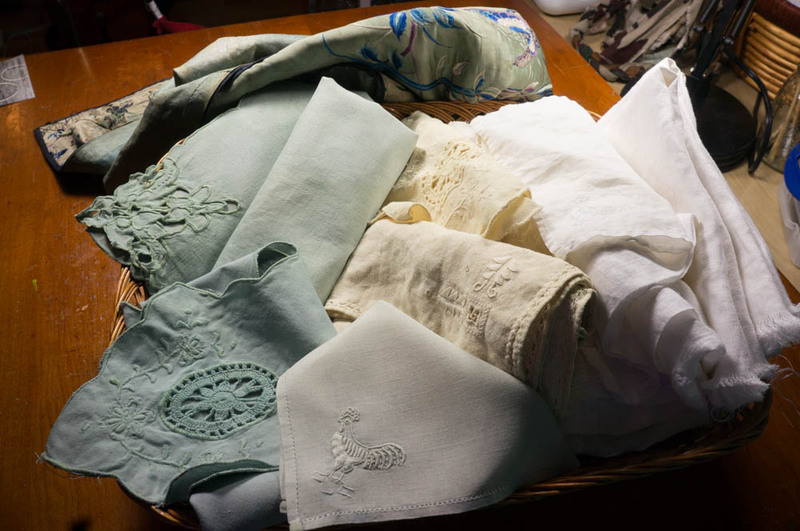 The result of these two treatments was the nice creamy color of the linens in the middle of the image above. Step 4. Finally! The cabbage! Had to cook the red cabbage for about an hour to fade the color from the cabbage leaves into the water. Then we strained the cabbage out and added 4 oz. of my linen (to save the rest for another experiment). Here's where I erred. If you read the recipe carefully all the way through, it says to LOOK at the color of the fabric-in-cabbage after 30 min. IF you want it bluer, add SALT. IF you want it pinker, add VINEGAR or lemon juice. I just dumped salt in at the outset. So, instead of lavender... I got bluish--in fact a greenish-bluish. (See fabric on the left of the image above.) When I was rinsing them, I spritzed some vinegar on the tiny rooster hankie--it turned more violet, all right... but then nearly ALL the color rinsed away. Egads, was it really worth all this effort????? 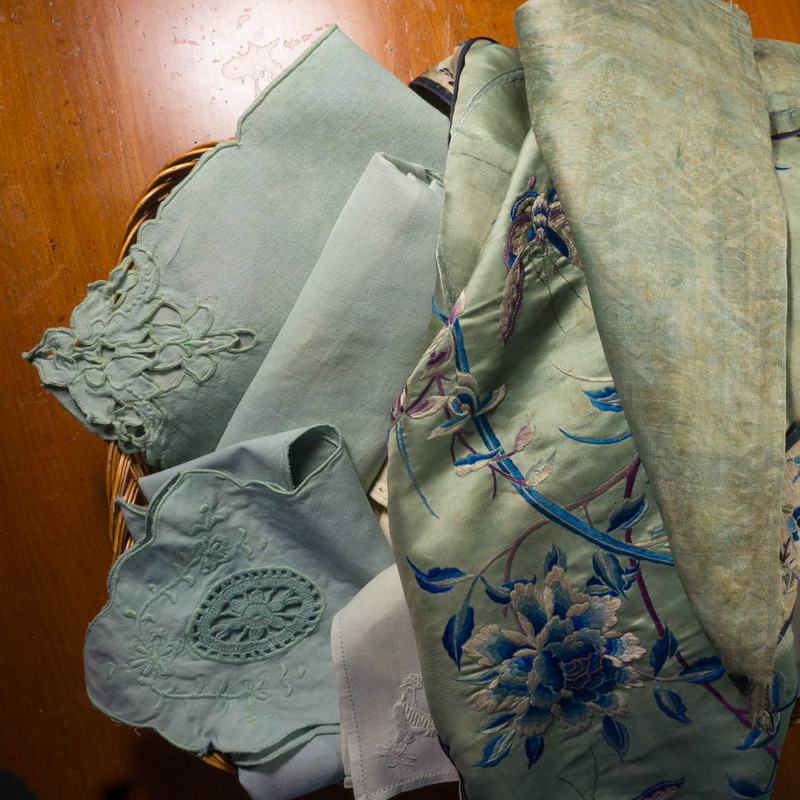 But then as I was ironing the red-cabbage cloth, I spied the old Chinese embroidery we bought a couple weeks ago. What attracted us to it, in part, was the lovely subtle green silk. And guess what? It was nearly the same color as our red-cabbage linen (see below). Oh! Good lesson here. If I want eye-poppin' color, stick to the commercial dyes. If I want subtle antique colors, go natural.